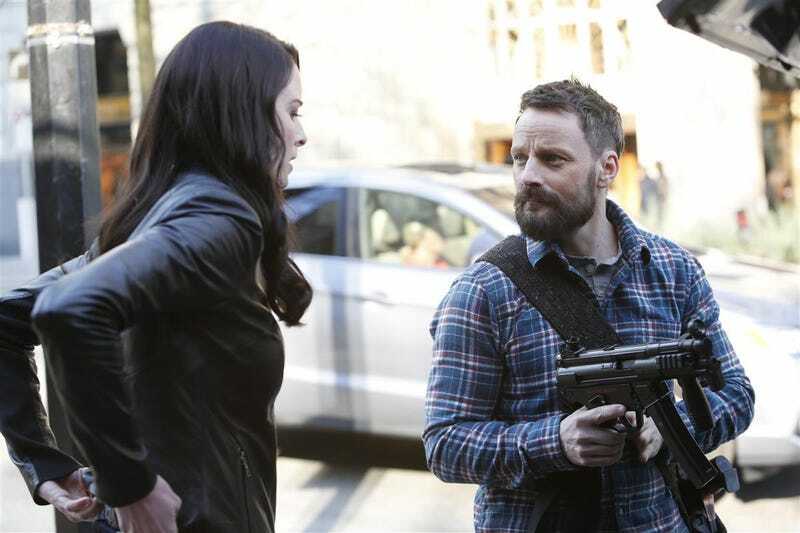 Is Continuum Preparing To Hit Another Reset Button? Last night's "The Dying Minutes" was a lot of fun, except that stuff happened at blinding speed and I kept having to double check that I hadn't missed an episode or two. This whole season has been like that — this timeline's Alec turned into a suit-wearing douchebag so quickly, it felt like we missed some crucial scenes, for example. And now, Brad and Kiera are "family" after a few episodes together. Most of all, Kiera has apparently accepted that she can never return to her family in 2077, but we never got to see her process that crushing disappointment. The penultimate episode of the season featured some huge reveals, and also killed off a ton of major characters. I had to rewatch it a second time to understand all of the cryptic hints, but it was sure fun to watch the first time. Favorite scene: When Kiera, Brad and Hoodie Alec are in the car and Hoodie Alec realizes that none of them is from this timeline. This show is still tossing around some weighty issues, but it's also ridiculously fun. To that end, Curtis joins forces with Brad Tonkin, the visitor from the alternate future who brought some fancy technology back with him. But after Brad double-crosses him, Curtis teams up with Kellog, who somehow knows exactly when Brad and Kiera will make their move on the Freelancer HQ. So Curtis "piggy-backs" on Brad and Kiera's assault, and frees the Traveler from his cage. The show went to so much lengths not to show us the Traveler's face, it seems likely he's a version of someone we've already met. Brad Tonkin was sent back in time to kill Alec Sadler, whose Halo bracelets created the hellish future that Brad comes from. But after Brad killed the other Kiera, he got randomly hit by a truck and got a case of amnesia, after which he and the remaining Kiera became friends. And he decided he was no longer up for killing Kiera's friend Alec, either version. Brad fights Curtis and apparently snags his high-tech device — the same one the Liber8 crew was trying to steal from that bank vault. This device is Brad's "Plan B", in case rescuing Hoodie Alec from the Freelancers doesn't work. Kiera has become very comfortable with killing lots of people. She basically murders half the Freelancers herself, and causes the other half to get killed through her actions. The Freelancers are a bit ruthless, but they seem to be trying to do the right thing and keep the timeline from contamination (something Kiera also supposedly wants) and they trusted Kiera and let her handle things her own way. So it's kind of a bummer that Kiera decides to go ahead and murder so many of her so-called friends just to correct her own mistake. Kiera has decided that she gave "the wrong Alec" to the Freelancers. And she agrees to give them Brad Tonkin in exchange for Hoodie Alec — but then she double-crosses them and busts Hoodie Alec out with Brad Tonkin's help. She hopes that Hoodie Alec can fix Suit Alec's mistakes, launching the Halo technology decades before it's supposed to exist — but instead, Hoodie Alec is pissed at her for locking him up in the first place, and in no frame of mind to help anybody. So she just lets Hoodie Alec run away with Emily. Oh, and Carlos gives her the intact time machine that Hoodie Alec buried. Dillon gets a pretty good send-off in this episode. One of the episode's standout scenes is the one where he and Carlos debate the ethics of what Dillon is doing, being on the board of Piron and putting corporate interests ahead of the public good. Carlos is only there to disassemble the time machine, so the Freelancers don't come and attack them, but it winds up leading to the best discussion of Dillon's tactics we've gotten thus far. Dillon wants to claim that he's just using Alec and his corporate resources, because that's what the police have always done — used the rich and powerful for their own purposes. And Dillon's argument is basically that there's a war going on, against terrorists and against highly organized criminals, and the cops need to be better equipped, with more surveillance. And the government can't give them what they need, so they have no choice but to go with Piron. Dillon's argument underscores the idea that the Liber8 crew from 2077 actually just hastened their own dystopian future by wreaking so much chaos that the surveillance state had to develop faster to react. The most revealing part is where Dillon asks if Carlos is going to keep busting Dillon's balls, and Carlos says yes. Dillon replies, "Good," because he needs someone to keep questioning his decisions. But at the same time, Alec gives a hint of how things really are, when he basically orders Dillon, his lackey, to violate police procedure and get him the time machine from the evidence lock-up: "Just get it done, Jack." When Sonia is leaving Piron HQ, Carlos manages to get her at gunpoint (because she wants to be caught, I guess), and Dillon orders him to shoot her in cold blood, after she's surrendered. Carlos won't comply, and later launches an internal investigation of Dillon — just as Sonia takes matters into her own hands (literally) and blows up herself and Dillon. And Sonia finally reveals the truth to Julian: that she and the others are time travelers from a future where Julian is Theseus, the anti-corporate revolutionary leader who kills "thousands." But maybe in this new timeline, things will be so different that Julian can find a non-violent way of handling things, says Sonia — right before she goes to blow herself up in a police station. Travis, who wanted to escape to the North with Sonia, is mournful when he realizes she's dead. So where does this leave us? Suit Alec realizes that Hoodie Alec is free, and he knows that Kiera has "changed her mind" about which Alec to support. Sonia's virus is still connected to Halo. Hoodie Alec is running away with Emily. Kiera and Brad are getting cozy together — while Brad still has that "Plan B" device he stole from the Freelancers. Travis is probably going to do something to avenge Sonia. Curtis has just freed the Traveler from his captivity. And Kellog has some larger game he's playing. And with so many main characters dead or compromised, I'm still wondering if the show is going to hit the reset button next week.